There was a rare planetary conjunction over the skies of LA this evening. 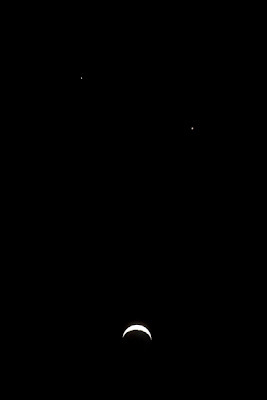 Jupiter and Venus along with earth's moon formed a frown face, I thought it looked more like a sad face, in the southwestern sky. This celestial event was once seen over Bethlehem on June 17 in the year 2 AD according to astronomers. The next event won't be seen until the year 2013.